I decided to read this book as research. Apparently, this is a brilliant work of world building, and that is something I am actively trying to better understand so I can do it better in my own writing. I hadn’t even read the premise before I decided to read it, but hearing about it made me very interested. The story is about a seventeen-year-old girl who was, at birth, marked by death himself. When she is a teen, she is taken to a convent that serves death (or St. Mortain, as he is known). She learns to be death’s handmaiden, aiding death by killing those he has marked out for her. One such task brings her into the heart of Brittany’s political turmoil, and soon her loyalties waver as she realizes not all is as it first seems. 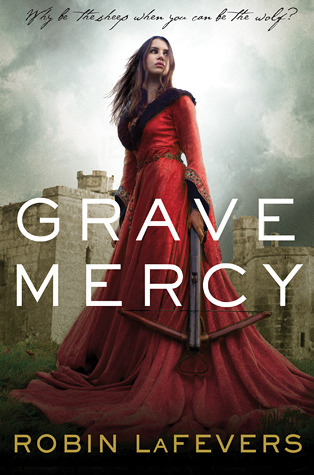 Like I said, the premise of this book was really cool…a convent of women trained to kill, serving a Saint, and only killing those that have already been chosen to die (basically, they are just the cause…the fact of the victim’s death is already pre-determined). I thought this was an awesome concept, and I wish it played out a little more in keeping of my original beliefs. The girls in this book are trained to basically be assassins, and it seems like most of their targets are men (which is good since they mostly seem to hate men…Ismae, the main character, has a reason for her troubles with men, but generally I hated this man-hating, girl-power vibe). Ismae eventually learns that death does not have to be vicious and solely a means to stop traitors, but for a long while this is exactly what the story seemed to suggest. I love the idea of a convent serving the god of death, but I would have preferred it to be a more sacred, circle-of-life kind of thing, rather than an army of assassins working to stop political traitors. This book is a historical fantasy, so I’m not entirely sure what to say about the world-building. It was detailed and obviously well-researched, but I don’t know much about the history of Brittany, so I can’t say for certain what its strengths and weaknesses were. I am not usually a fan of historical fictions, but I was kept fairly interested in the story here. The mysteries were intriguing, and I was continually curious to see how things would end up for the duchess of Brittany. There were some times were I was dreadfully confused (such as with the duchess’s age. I had no idea how old she was supposed to be), but I’m not sure if these were facts omitted from the story, or just things I missed in my reading. The main problem I had with this book was the romance. First, let me say that I love the hate-slowly-turns-to-love relationship. My favourite fictional relationships are like this. But for me, in order to do this relationship well, there has to be history. There has to be a reason why the characters hate each other, and a series of events (or a single shattering one) to make them feel differently. Grave Mercy was the type of story that started with the two main characters being disgusted by each other, and then about 50 pages later they obviously liked each other but spent another 200 pages pretending they didn’t. That just doesn’t work for me. It makes me roll my eyes and want to skip whole sections of the book. All in all, this was a decent read. It was long, I really wasn’t a fan of the romance, and the author used the same phrases over and over again (I can’t possibly tell you how many sentences began with “In truth”). But I thought the political story was very interesting, the concept of the convent serving the saint of death was awesome, and generally the style of writing was well-suited to my tastes. I do want to read the second in the series, but if it is as long as the first book (which I imagine it will be) I’m not sure if I’ll be reading it anytime soon. Yes, I've heard that about Graceling, too! It's somewhere on that unending reading list of mine, but perhaps I'll have to bump it up. Thanks for the recommendation!